Do you know one of the most effective ways to prevent extinctions or Endangered Species listings? Forty percent of our world’s plants and animals, thousands of them threatened with extinction, rely on just five percent of the Earth’s surface area, islands. Unfortunately, the natural balance of more than 90 percent of our world’s islands are disrupted due to damaging, non-native invasive species. Of the 245 recorded animal extinctions since 1500, 80 percent were on islands and invasive species were responsible for the majority of them. The good news is that the removal of invasive species from islands is one of the most effective interventions for saving imperiled species and restoring island ecosystems. This has successfully been done thousands of times; and some of the most important island restoration projects were done through partnerships involving the Service and Island Conservation. 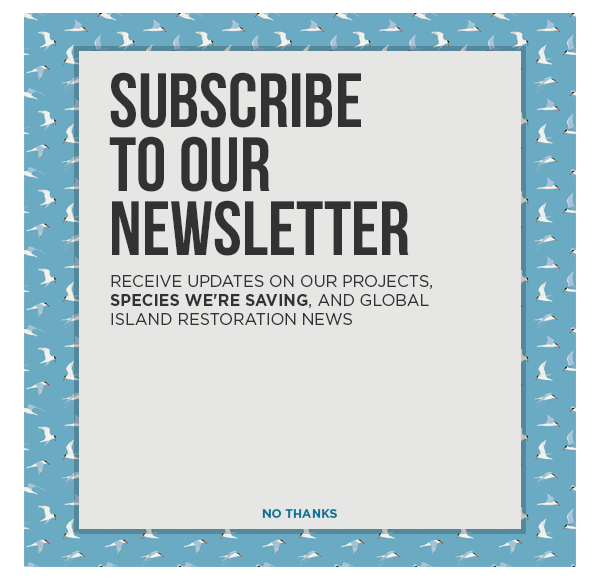 On April 16 we redoubled our commitment to our successful, 17-year-old conservation partnership with the Service through the formal adoption of a Memorandum of Understanding (MOU) to save imperiled island species. Since 1998, the Service and Island Conservation have worked in partnership to remove invasive vertebrates from more than 22 island ecosystems in the United States and internationally (e.g., Canada, Mexico, the Caribbean, and South America) to protect 46 imperiled species to date. So, it was appropriate and symbolic that we signed the MOU at the most recent meeting of the Canada/Mexico/U.S. Trilateral Committee for Wildlife and Ecosystem Conservation and Management in San Diego, California. Through the removal of invasive species from islands, we’ve achieved multiple species conservation milestones, including the removal of Endangered Species Act protection for species like the Island Night Lizard due to the species’ recovery. The MOU promotes an integrated and coordinated approach to invasive species removal through project implementation, information exchange, education and training, coordination, and taking inventories and monitoring. Working together, we will ensure that the best available science and management practices are updated and employed for future island invasive species removals. But we can’t do all this alone! We welcome other conservation agencies, organizations, and leaders who share this vision to become additional parties to the MOU. If you are interested, please contact: cade_london@fws.gov, john_klavitter@fws.gov, and Gregg.howald@islandconservation.org. Working together, we will continue to prevent extinctions by removing invasive species from islands.